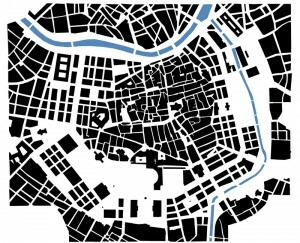 An urban variations project by Adolf Loos (1912) with maps by Johannes Bouchain (2007). The Vienna Ringstraße is generally regarded as a masterpiece of 19th century urban design. However, the Austrian architect Adolf Loos wasn’t quite satisfied with the results he saw in 1912. 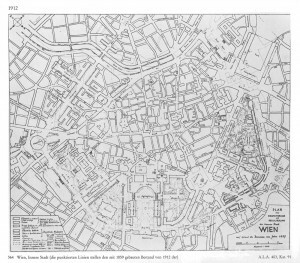 In an exercise of urbanistic invention, he sketched an alternative plan for the Vienna Ringstraße as he thought proper, departing from the situation of 1859 when the belt of fortifications had been removed. 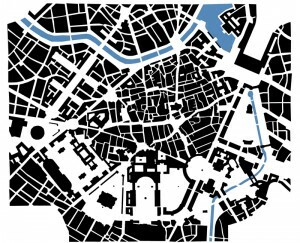 It is interesting to see how Loos takes great care in establishing defined urban spaces, axes between important places, viewpoints and landmarks, interweaving the old urban fabric with the new structures and monuments. The combination of harbor and railway station in the top right corner is especially remarkable. The new category of Urban Variations has been added to Urban Geofiction. Have a look at the interesting projects.